Photo taken at North Mountain, Phoenix, Maricopa Co., Arizona. March 2005. 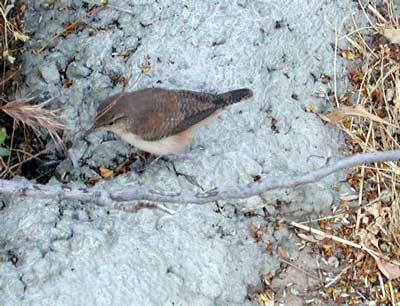 Rock Wrens are among the most commonly encountered birds in the Sonoran Desert. As their name implies they are most at home on rocky slopes and around small mountains. Food consists primarily of insects and spiders that they extract from nooks and crevices with their longish beak. Rock Wrens are year-round residents in the Sonoran Desert but some individuals migrate as far north as Southwestern Canada during the summer.